AutoCAD Block Libraries of Plumbing Fixture Symbols. This is an extensive set of CAD plumbing design blocks. 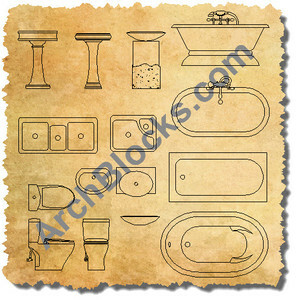 You will find AutoCAD symbols for all your kitchen and bathroom CAD design projects. These plumbing CAD blocks can be dragged and dropped right into your design project drawings very quick and easy using AutoCAD's Design Center, or Content Explorer, or use Content Palette in the MAC version. All the plumbing fixture drawings are created at real world sizes so they fit perfectly into your floorplan and elevation CAD project drawings. Save Time! This plumbing fixture library is available to Download NOW!